"James Blair, a former Army Ranger, collapsed on the bathroom floor and suffered a hemorrhage stroke on April 30, 2016 at the age of 51. James is an honorably discharged Army Ranger, served at Ft. Ord in Monterey, CA. Originally from Columbus, TX but has lived in Katy for over 20 years. He had some PT, OT and Speech Therapy at Methodist Willowbrook Hospital after a surgery that stopped the right side brain bleed and saved his life. He has left side deficit, but no post-stroke cognitive or memory loss issues at all. He did lose some vision on the left in both eyes, but with vision therapy, was certified to drive again after a year. James was sent home 10 days after being admitted to the hospital since he did not have insurance. Methodist did provide 6 home therapy visits, but that's it. A friend was then able to get Spero Rehab in Katy to work with him for the next 6 months pro bono. His veteran status then helped with additional PT and OT at their local Outpatient Clinic. He was discharged from the VA. After 4 months, he was functional but far from recovered. 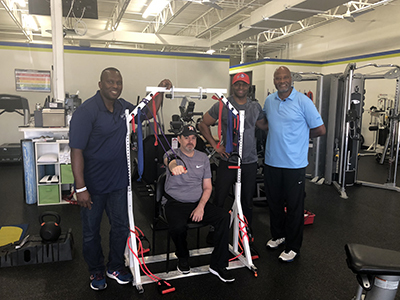 Jason was able to find Andre, a trainer, through Jason's Medical Fitness Facebook post about a stroke recovery seminar. James began therapy with Andre and Dr. Mike and has continued faithfulyl ever since. It has really made a difference and James is determined to make a full recovery. James is incredibly focused on regaining full range of motion, stability and mobility - post stroke. The Ultimate Workout and Recovery (UWAR) System provides a new way for him to achieve this goal. Using its multiple components which target the specific muscle groups, he is trying to improve. Workouts can be customized based on strength level. 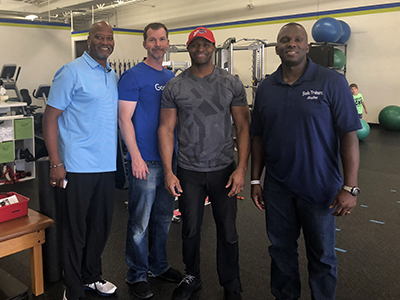 James would be able to further enhance the benefits from his group therapy sessions and accelerate recovery on his own at home by having access to this piece of equipment on a daily basis."